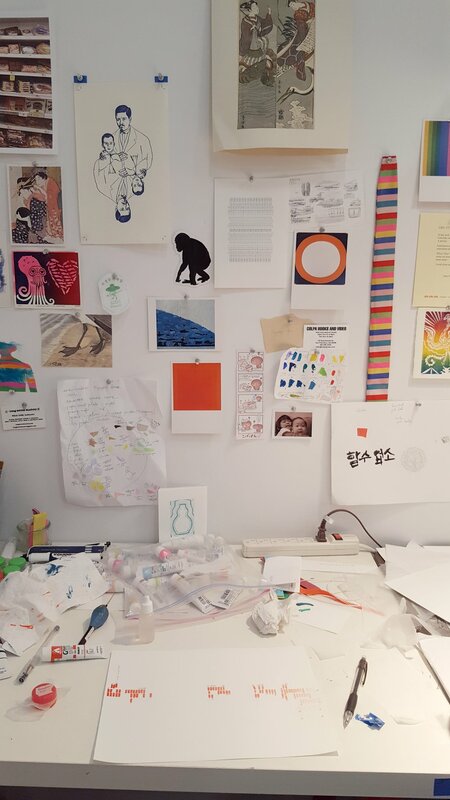 A few weeks ago i went to the UC Berkeley MFA open studios and got to see what all 12(!) of the current students were up to. It was my first time visiting Cal's Global Campus, which was...let's just say, rustic. The setting was very woodsy, with a lot of grassy fields separating trailer-like buildings; it felt worlds away from the main campus in downtown Berkeley, which i guess, it is. In the pouring rain I went from building to corrugated metal shack to muddy field and back and ended up seeing some pretty interesting stuff. Notable to me, were the unassuming oil paintings of Isaac Vasquez Avila, done mostly on found paper with kind of an Outsider-esque sensibility. Takming Chuang, essentially a printmaker, is incorporating endurance-performative actions into the making of his work, using shapes and 3D objects pressing into his own body, and in turn using the imprint to make more traditional prints. The above is the only piece I got a picture of: a painting by Lucas DeGiulio. I'm not sure if it's in process or finished, but I couldn't stop long enough to stare at the 4' x 8' sheet of wood with its carved, ink, and graphite lines. I'm looking forward to seeing the Grad show this summer at the BAM.